If you have to work at home, you might as well do it in style!. Your home office might actually be the most important room in your house. Home Xpressions offers office furniture including desks, cabinets and chairs from a variety of high quality furniture makers. 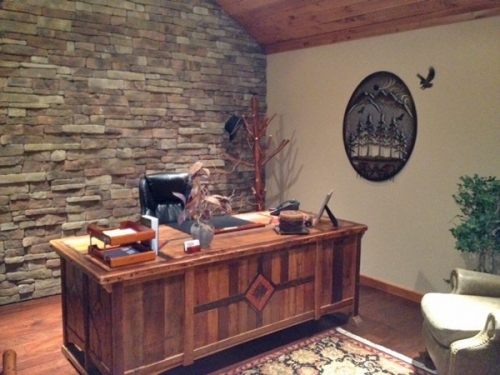 Home Xpressions is a leader in Barnwood Furniture, which is a very popular choice for home offices. Please visit our Barnwood Furniture page for more details. The Barnwood Desk shown above, is made of antique barnwood and is classic in design and function. This rustic yet elegant piece offers an interesting contrast between color and texture. This desk can be custom built to compliment any sized room. Four deep set drawers provide ample storage. Beautiful metal and wood inlay options may be added to either the barnwood table top or base for a truly unique rustic desk design. This design will work in traditional, cabin, camp, ranch & western decors. Naturally aged barn wood furniture is a truly a transitional look as it is rustic, but also refined so its use is only limited by your imagination.